As the saying go, it’s always good to make a great first impression. How about making it into a Perfect 10? Resorts World Manila’s fine dining restaurant, Impressions, made a pretty good one to the Asia Tatler Dining, which gave them a perfect 10 rating for cuisine, wine selection, setting and service. Last week, I was fortunate enough to get invited to experience perfection. 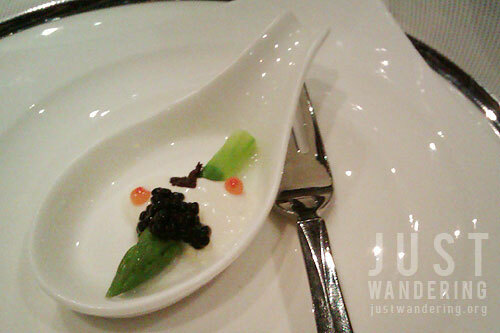 It started with an amuse bouche of asparagus spear with herring caviar, which was absolutely divine. It gave us a hint of what’s to come. 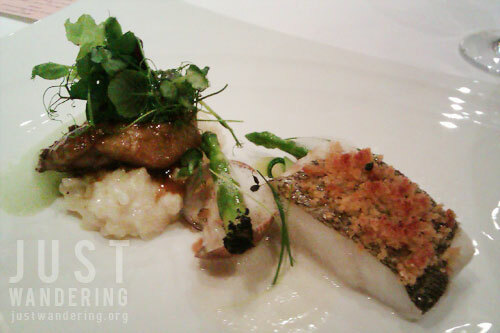 It was the Perfect 10 Feast, a special degustation menu that features the restaurant’s top selling items. 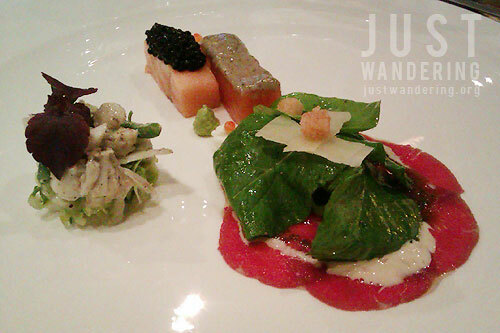 The feast starts with the appetizers: Crab with romaine salad, celery, green beans and green apples tossed in truffle mayonnaise dressing; Duo of salmon “Demi Deuil”: marinated salmon with truffle sauce and smoked salmon with herring caviar, green pea hummus, and; Beef Carpaccio, arugula salad with parmesan cheese and Dijonnaise sauce. Everything in the plate was delicious, but I have to say, I am partial to the salmon demi deuil. If you can pick just one appetizer, go for this. 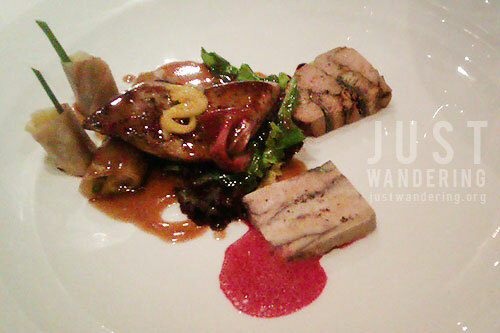 It was followed by a trio of duck liver salads: Seared and lacquered duck liver, mango rougail roll in a crepe with plum sauce; Duck liver terrine de foie gras de canard, grilled ell, and Terrine of duck liver medoc with mesclun salad and beetroot foam. Eating this was heaven. It was very rich, but the portion was just right that it’s not overwhelming, and it was melt-in-your-mouth tender. Heaven. Steamed cod fish, crumble of chorizo with ginger and lemongrass emulsion. It was a great follow up to the rich duck liver, with a lighter flavor. Before our dessert was served, mignardises were laid on the table, small, bite-sized sweets before the big finale. 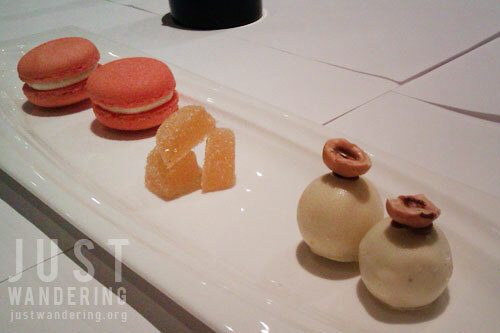 Delectable Hazelnut chocolate, Passionfruit pastilles, and Orange macarons served to ease us into the next course. 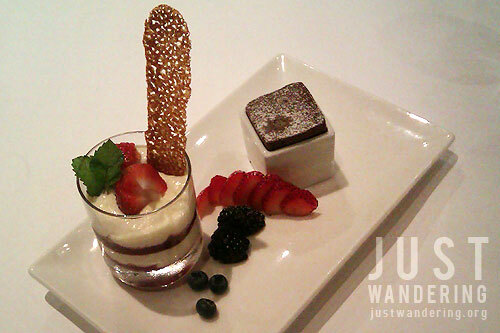 For dessert, there was the Strawberry/mixed berry tiramisu, and Dark chocolate souffle with coconut creme anglaise. It was a superb way end to a spectacular meal. The tiramisu is unlike any I’ve tried, and that souffle. Oh my. Perfection. The Perfect 10 Feast is available until November 15, 2012 for Php 2,000 per person. For reservations, call the Impressions reservations hotline at (02) 908-8883. Everything looked too pretty to eat! Omg…PH2, 000? I’m SOOOOO there. That’s a steal for that price. How far in advance do they take RSVP’s? The dessert looked so…nom-I-licious. Wow! Looks amazing! Really must try it next time we drop by Manila! Are you a Happy Filipino?